To bring the benefits of e-commerce to China’s less-developed regions, Internet companies like Alibaba Group have been investing in logistics and other infrastructure to give rural residents greater access to goods and services and the ability to participate more fully in the country’s economy. 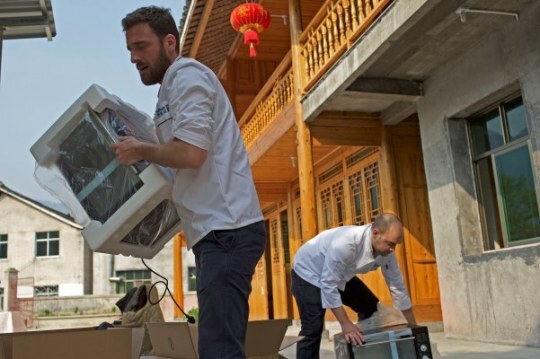 Starting last year, Alibaba began setting up thousands of Taobao Rural Service Centers in outlying areas where locals can order from the company's shopping websites, pick up merchandise and even receive training and support for their own micro e-commerce ventures. 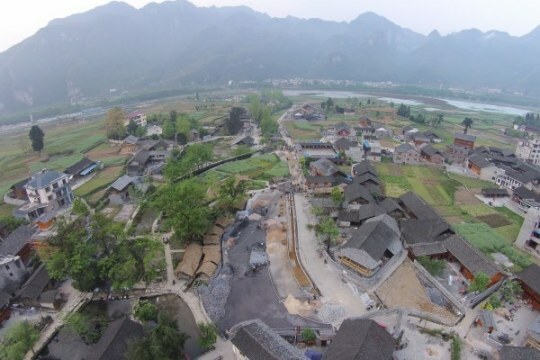 NOT A PIZZA HUT IN SIGHT: Yunshe Village is located in the Wuling Mountains in China’s Guizhou Province about 330 miles southeast of the city of Chongqing. The population is largely made up of the Tujia people, an ethnic minority with a history dating back some 12 centuries. 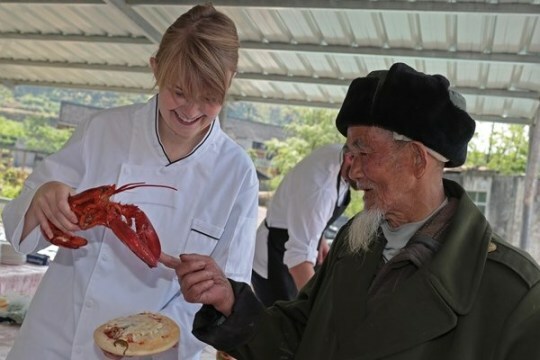 With Chongqing an eight-hour drive away, Yunshe’s isolated residents don’t have many opportunities to patronize restaurants and retailers. 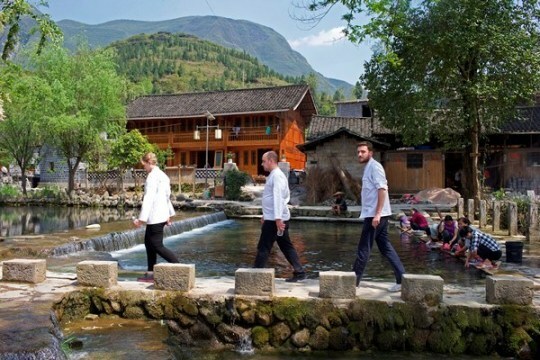 ABBEY FOOTPATH: The visiting chefs—Cadence Hardenbergh (left), Aaron Ayotte and Maxime Marboeuf—made a Beatles-style entrance to Yunshe Village by way of the local watering hole. Yes, the women in the photo (right) were doing laundry. FOODIE ROADIES: The kitchen crew had to haul in their own ovens and other basic cooking instruments. 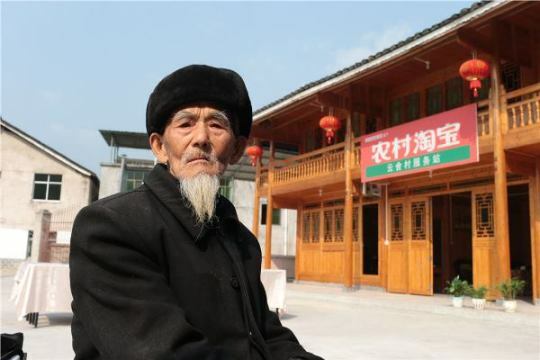 BIRTHDAY BOY: Yang Chuxue, the 92-year-old guest of honor, outside the Taobao Rural Service Center where the banquet took place. GO EASY ON THE PARMESAN: Pasta was on the menu. So was pizza, lobster, angus steak, lamb ribs, salad, cream of mushroom soup, pudding, and a nice red wine. THIS TASTES NOTHING LIKE RICE: Local schoolkids dropped by to sample the ingredients. 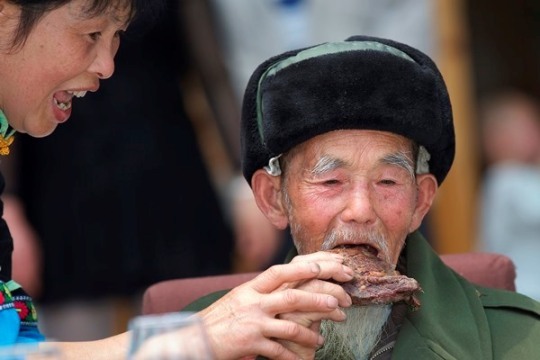 GIVE ME BACK MY CHOPSTICKS: With his family looking on, Yang got a lesson in cutting steak with a knife and fork from chef Cadence. HAND-MOUTH COORDINATION: Evidently unimpressed by Western cutlery, Yang skipped the middleware and just went for it, with an assist from daughter-in-law Zeng.